Imogen's Typewriter. 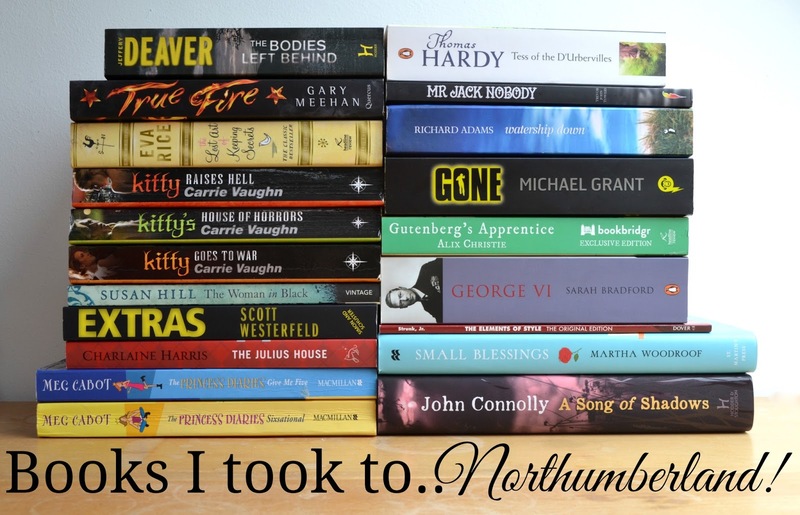 : Books I Took to Northumberland! It's a well known fact that I overpack books when I go on holiday. I've gone away with sixteen books, and even nineteen books. This holiday I outdid myself and took twenty! However, it was Northumberland and we drove so it wasn't like I had a weight limit. Even so I was pretty determined to make a dent in the piles I took and I read five/twenty over the week. I'll be doing a round-up of those five on Monday so look out for that! I'm a big fan of Jeffery Deaver but I haven't read any of his books in a while and I don't feel like starting another series since I have so many unfinished at the moment. So! I picked up one of his one-shot books that I remember reading when I was younger. It's a little different from his usual books but more about that on my post on Monday! Gary Meehan is actually from my town! Despite this, I still haven't read this book yet after winning it from Goodreads last year. I keep meaning to and I really like the premise but again, I'm hesitant to start another series since I have so many on the go at the moment- I may or may to have just started the Sookie Stackhouse books. Maybe this will be the next series I start once I finish some up. I don't know much about this book apart from that it's set in the 1950's, has ah-mazing reviews and a forward by my idol- Miranda Hart. And it's a one-shot so no series guilt for me! I love the Kitty Norville books but I haven't read one since November and I thought if I took three then I might be more inclined to pick them up. It didn't work but it seemed like a solid theory at the time! I'm not one for scary movies, in fact I avoid them apart from the ones I watch with my friend when we play who can pick the worst horror movie. But my cousin told me to watch Woman in Black, it was on Netflix when I first got it and it had Daniel Radcliffe in who I think is a great actor. I watched it, it scared the bejeezus out of me, and I loved it. On top of them, I'm going to see the play soon so I wanted to read the book before I did. I read and reviewed the Uglies Trilogy back in February after hauling all four books way back in November. But I haven't read Extras yet, the add-on book. I just don't have the inclination but it bothers me seeing the trilogy on my 'read' shelf and this on my 'to-read' pile. I love this series and I love Charlaine Harris's writing. This in the fourth book and I actually got it for Christmas but seeing as I'm on a book buying ban of sorts, I didn't want to read it and immediately want the next book. But I did. And I do. Dang! I picked up the fourth book of the Princess Diaries series last month and decided to just keep reading. Both of these got read and I may or may not have bought the last four books from an independent seller on Ebay- all within my book buying ban perimeters of course. I can't remember what teen book I read at about twelve where the protagonist was reading this but it has literally stuck with me for about ten years. I want to read this because I love the classics I read last year and this sounds right up my street, but I'm also dying to remember the book that led me to this. Anyone know? This was sent to me recently and it sounds great so I brought it along since I had some space left, I didn't get around to it but it's top priority so expect to see this soonish. "It's a good book. It's about bunnies." I've been showing a couple of my friends Lost since they never watched it and that is appalling to me. And Watership Down is an important book both as a physical object- it gets talked about a lot and causes a lot of tension, and as a foreshadowing type of thing. I need to read this soon. This is the first book in the Gone series, my best friends favourite series, and after starting it on Playster I pulled out the copy I bought this time last year in a English book store in Florence. I'm actually currently reading this at the moment and I'm a bit- eh. Another book I've been sent that I really probably should've read by now. It sounds so so interesting but I'm a mood reader and I just haven't felt like this kind of book lately. Soon! Soon or bust! I love George VI and this is a full biography of his life that I got last christmas after watching The Kings Speech- an amazing movie. I'm not much of a non-fiction reader but I want to start adding some in with all the fiction I'm reading. I have to read this for my degree and I was thinking I'd sit down and read it cover-to-cover rather than dip in and out like I have been doing. Set in a small English town, this seemed like the kind of book to take on a trip to Northumberland. I did actually pick this up while I was away and read a good 50 pages but it just wasn't for me at that time. Maybe later this year I'll pick it up again. We all know I love the Chronicles of the Invaders series that John Connolly writes with Jennie Ridyard so I was pretty excited to receive one of his solo books, a detective mystery that I'm really looking forward to. It's quite far on in the series but I'm hoping I can pick it up without reading any of the past books. Phew! Lot of books! Am I the only one who overpacks books? *I won these books on Goodreads! **I was sent these books for review! This doesn't change my opinion.